Big rod-caught pollack can weigh 7.25 Kg (16 lbs) or more. The average pollack weighs around 2.26 Kg (5 lbs). The pollack has a dark olive-green back, gold/silver sides, which can be a copper colour in some areas and a white underbelly. It has a particularly strong lower jaw which distinctly protrudes and there is no barbel on its chin. The pollack has a high lateral line which distinctly curves upwards and it has three dorsal fins. Whole fresh small fish such as sprats, pilchards, sandeels are ideal for pollack fishing. Fish strips such as mackerel and herring are also good. Ragworms, prawns, peeler crabs and shrimps can also be used. There are also artificial baits which can be used, rubber or plastic sandeels, spoons, devon minnows or pirks can all be used. Pollack can be caught throughout the year, during May, June, July, August and September pollack is best caught inshore, from mid-October to April it withdraws into deeper offshore waters. The pollack favours the base of weed-covered rocks, reefs and wrecks at which to feed. The biggest catches are deep water off the West Country, and southern Ireland although pollack can be caught from most rocky areas around the British Isles. Rocks, piers, jetties or harbour walls are the best spots for catching pollack and a sliding float rig or a rotten bottom rig cast onto rocky seabed are ideal. If you are fishing from a boat for pollack a rotten bottom rig is advised (see above). Live small fish, hooked via the upper jaw behind the lip make the best bait for catching pollack. Pollack rise to feed near the surface at dawn and dusk, therefore these are the best times to catch pollack. During the day pollack dive deep down and stay close to the seabed and stay tight against rocks. 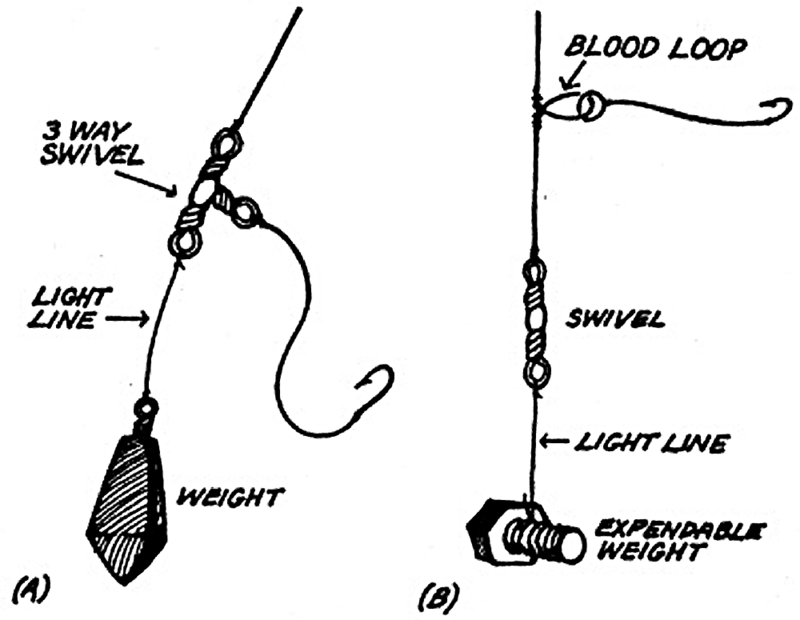 Hooked pollack are known to dive amongst rocks and this can snap your line. Avoid this by keeping your line taut and reel-in as fast as possible. If you want really big pollack, the best spots are above rocks and wrecks in deep offshore water.